Where on earth do I start with the Flower Girls. I guess the beginning is as good a place as any...? It is Summer 1997, the day is hot and Primrose (Rosie) and Laurel and playing in the park near their house when two year old Kirstie Swann is murdered. Nineteen years later and Hazel is about to celebrate the New Year with her partner and Step Daughter, when the hotel where they are staying raises the alarm. A five year old girl is missing... and Hazel worries that as soon as her identity is discovered she will be a prime suspect. Nineteen years earlier under her former identity, Six year old Rosie looked on whilst her Ten year old sister was convicted of Kirstie Swann’s murder. Both were implicated by the press and were quickly dubbed the Flower Girls. 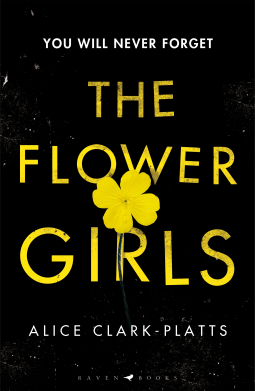 When Hazel’s true identity is discovered, the Flower Girls hit the headlines all over again. Alternating between the present day (of the novel) and 1997, we learn of Rosie and Laurel’s childhood, the time before, during and after Kirsties murder and Lauren’s conviction. We are constantly forced to query what we think we know and there is a deep sense of unease throughout the novel. But Hazel/Rosie and Laurel aren’t the only interesting characters in this novel, an ex journalist, determined policewoman, Lauren’s solicitor and Kirstie’s aunt are all fascinating in their own way. And are all asking the questions that we the readers are asking in our heads; should Laurel be released now she has done her time? Does Rosie remember more than she let’s on? Is justice ever really done for a child murder? What kind of child wants to kill or harm another child? Should family members linked to convicted criminals be allowed new identities? I can’t guarantee that all of these questions will be answered, but I can guarantee that you won’t put this book down until you’ve finished it. And then you’ll probably pick it up again, because you’ll probably need to read that ending twice. Just to be sure. The Flower Girls is available from 24 Janaury 2018.